Medicinal plants the way forward? There is a growing distrust about pharmaceuticals with their myriad of side effects and high price tags. The movement is changing from going to the pharmacy to going to the FARMacy. In other words, looking to plants for healing. The following ten websites are about medicinal plants and how people can use them for their preventative and healing properties. This list is not designed to provide medical advice, but to give readers some ideas for research. Take as much care when using natural remedies as you would those found in a drug store. The sites are listed in order of their Alexa traffic count rating. The Medicinal Plant Working Group (WPWG) is involved with preserving plant species that may have medicinal properties. They work to form partnerships with industry, government, academia, tribes and environmental organizations to that end. The site includes plant information for a number of medicinal plants including black cohosh, ginseng, stoneroot, white sage, echinacea and bloodroot among others. Be sure to check out the publications section. Just in case you might have thought that all the medicinal plant information is coming from nonprofessionals, this site is included to show you that there are scientists also involved in the plant derived natural products that have compounds useful to mankind. They are involved in metabolomics which is the science of determining the small organic molecules in a cell of a biological sample. Although you might find this a bit more scientific than you desire, it is interesting to see the science behind medicinal plants, of which they go into depth on 14 specific plants. Plants for a Future is a charity involved in researching and providing information on edible and otherwise useful plants suitable for growing outdoors in a temperate climate. About 10 years ago, they began compiling a database, which currently consists of about 7,000 species of plants. This searchable database is a fabulous resource. If you find it useful, please consider a donation to help them further their research. Be sure to spend some time on the plant uses section which includes edible, medicinal and other uses for plants. Horizon Herbs is located in Southern Oregon and although they are involved in selling seeds through their catalog, the site has a lot of value in that the online catalog also talks about the various medicinal herbs, along with their other offerings including culinary herbs, cover crops, vegetables, house plants and more. They also have a number of medicinal herbs that you may have difficulty finding, so this is a great resource for growing your own herbal medicine garden. The American Herbalists Guild was founded in 1989 as a non-profit, educational organization to represent the goals and voices of herbalists specializing in the medicinal use of plants. The site includes a number of educational resources including professional herbalists training webinars and herbal medicine FAQs. You can use the website to locate an herbalist or even an herb school if you want to take your education to a higher level. Be sure to check out their herbal events calendar. The American Botanical Council is an independent, nonprofit research and education organization dedicated to providing accurate and reliable information for consumers, healthcare practitioners, researchers, educators, industry and the media. The site includes a lot of great information including an herbal library which includes databases and resources. Be sure to take a look at their clinical guide to herbs. You can also register to receive an eNewsletter from them. This site is very comprehensive, so expect to spend a great deal of time here and you will learn a great deal. 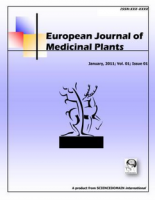 This journal is dedicated to publish high quality papers in all areas of medicinal plant research. It is another example proving just how much the scientific community is involved in medicinal plant research. It really isn’t surprising since prescription medications are often developed by first studying the effects of medicinal plants. The site allows you to read articles from the current issue as well as some archived issues. You will find an interesting amount of information on medicinal plants on this website including a listing by common name, scientific name and active ingredients and components. There is also a discussion of the pharmacological and therapeutic benefits associated with the various medicinal plants. The nice thing about this site is it addresses food you probably already eat, such as grapes, ginger and coffee so that you can see just what benefits you could already be enjoying. You can also pull up information by pharmacological action such as analgesic, antibacterial and anti-inflammatory properties. This is a site maintained by a medical herbalist as an information resource for anyone interested in medicinal herbs and their applications. It would be a great resource for students, botanists, gardeners and cooks, for example. The site includes herb profiles, treatments, recipes and also shopping. Online shopping is for UK customers only, but you can email an order for international shipping. Most people probably do not realize how involved the government of India is regarding medicinal plants. They even have a National Medicinal Plants Board (NMPB), which can be found at http://nmpb.nic.in/. This site is a regarding the database being developed by the FRLHT (Foundation for Revitalization of Local Health Traditions) with financial support by the NMPB. This holds the first version of the database with 7,250+ botanical names and 1,000,000 vernacular names. It also includes 5,000 plant images. Users can search in a number of lists including Ayurveda, Siddha, Unami, Homeopathy, Folk and Sowa-Rigpa. So, there you have ten useful sites for learning more about medicinal herbs. As stated before, do not consider any of these sites as a substitute for visiting your healthcare professional. Mixing prescription medications and medicinal herbs can have unintended consequences, as can stopping certain prescribed medication.